Finished our “Urban Texas ” style garden! 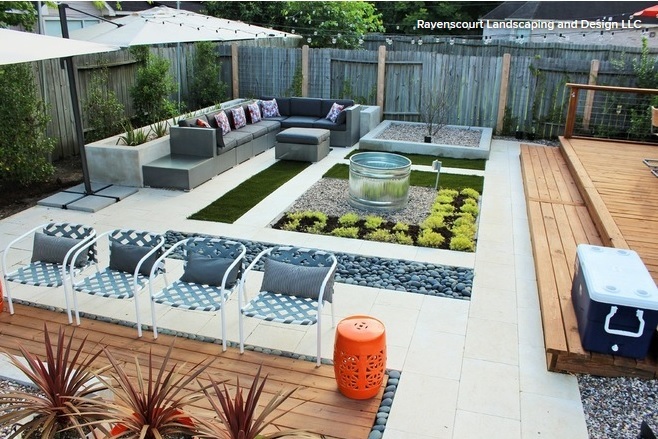 A water permeable patio and outdoor cooking area. The mud pit finally dried up and we put in the flagstone and gravel patio. I talked about this in my earlier blog – https://ravenscourtgardens.com/2014/03/17/latest-install-bogged-down-by-much-needed-rain/ While it is not evident here, these flagstones are between 4 and 6 inches thick and cut into the native soil. Went there Saturday after the rain to give the homeowners a thank you gift and everything looked high and dry. Could not resist buying a forged metal triangle to hang on the shed roof cooking area. 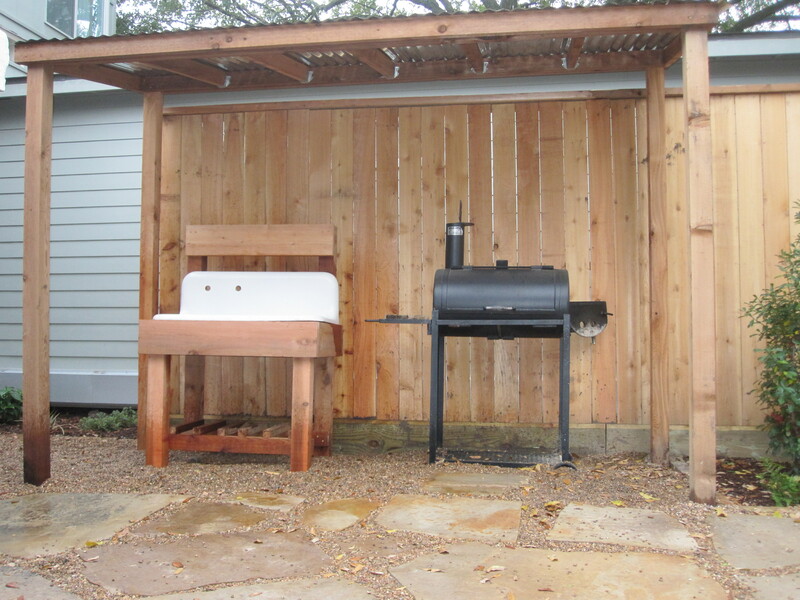 A very rustic outdoor kitchen. 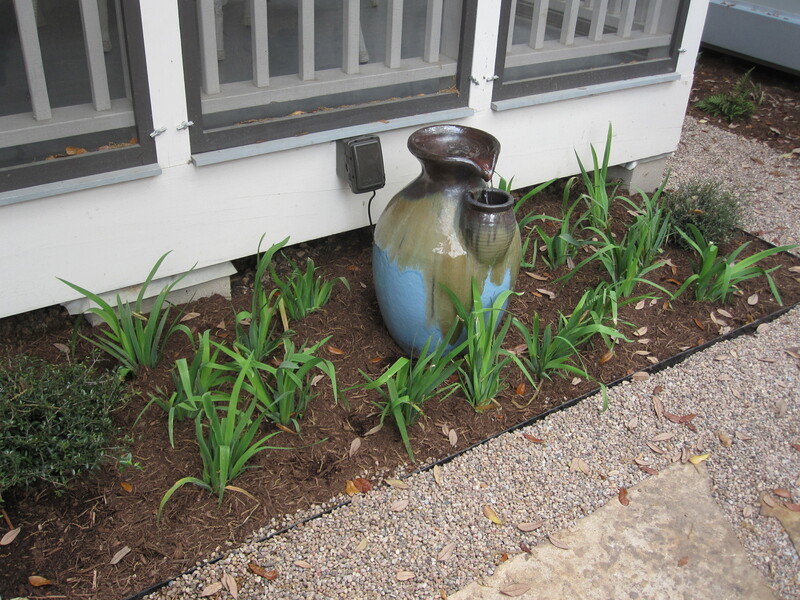 Charming fountain in a bed of Louisiana irises. The sound of running water is always soothing. We made a place for a fountain right outside there screen porch so they could enjoy the sound inside and out in the garden too! 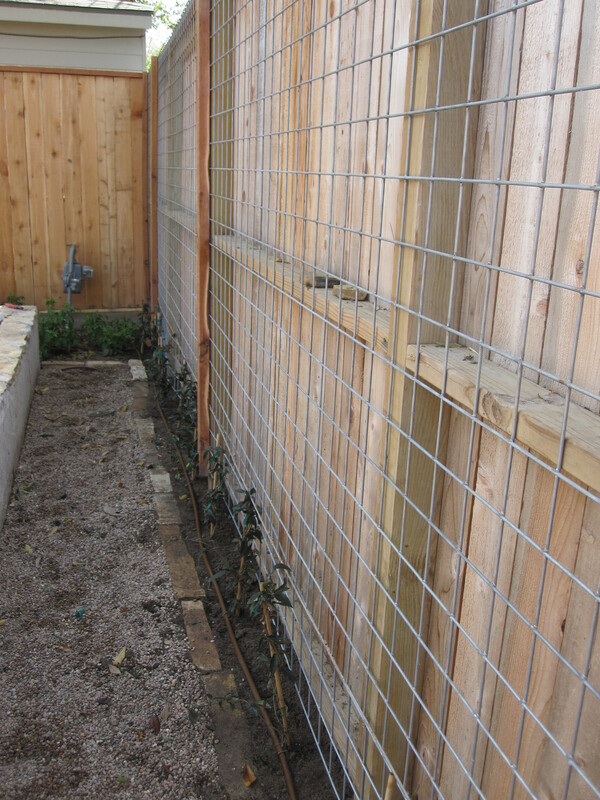 Welded wire panels are installed on the back fence and planted with Tangerine crossvine. In a year or two it will be a wall of green. The bigger shrubs, on the fence we built between the houses are Savannah hollies. They can grow up to 30 feet tall but take hedging very well. There is drip irrigation in all the beds even the raised herb and vegetable bed. The walls of the raised bed are made to be 18 inches, a good sitting height for weeding and during a outdoor gathering! 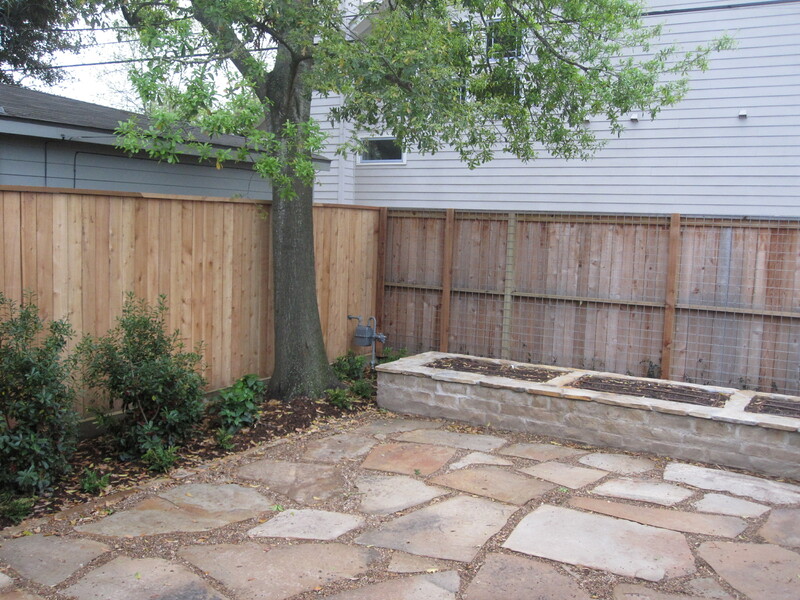 The new fence and plantings will help deaden the sound and hides the neighbors A/C units. Tangerine crossvine on welded wire panel before the mulch. Notice the strand of drip tubing (which will be covered in mulch). 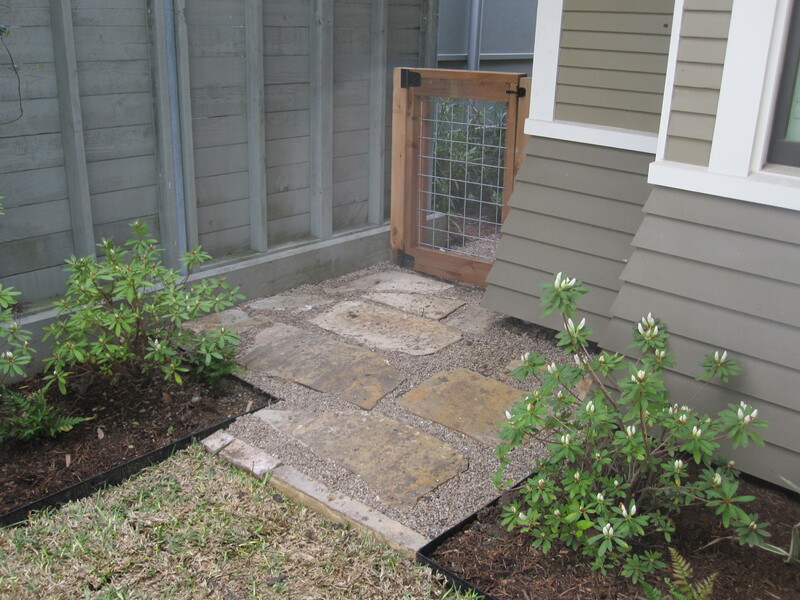 We found that the thick layer of gravel behind the raised bed allowed for passage as well as drainage. We built a gate to keep the puppies in the back yard and extended the path out into the front garden because it often became a mud pit. In areas, such as this, where there is little sun and poor airflow turfgrass does not easily flourish. 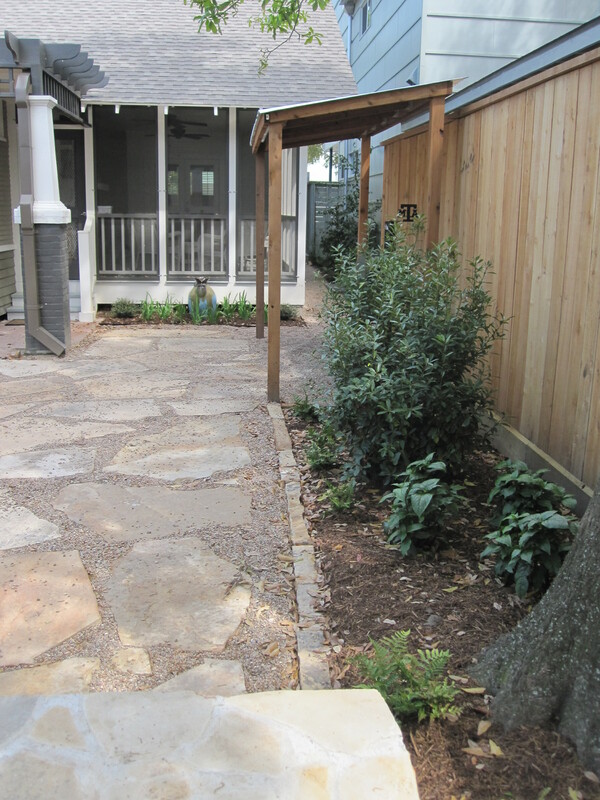 We took cues from the rear yard and made a welcoming (and low maintenance) path into the side yard. Wow. 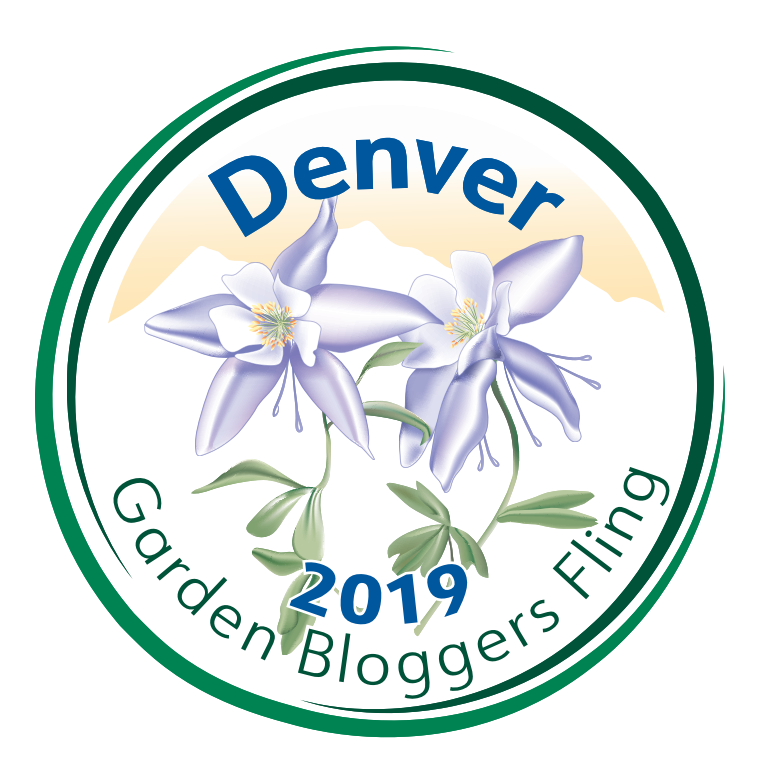 Looks great now and will look fabulous when the plants grow up — especially the wall of crossvine. 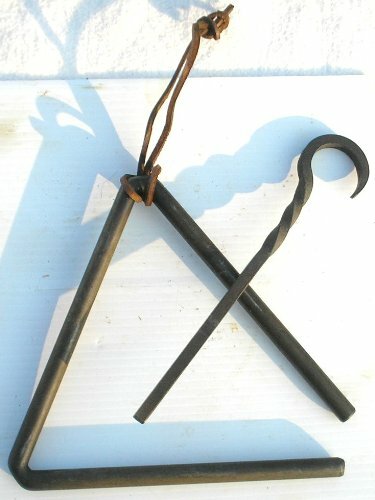 I really like the metal triangle. Nice touch. I also like the solution to joining the two areas. That has been the trickiest thing for me as an amateur, especially since there have been so many previous DIY owners who each had their own ideas that they started and then left incomplete. i have no IDEA what their vision was supposed to be. haha I will just pretend those problems are opportunities. I am sure the people living there are going to really love what you have made for them.